We are familiar with the term of air, water, and land pollution, however do we know that light can also become a pollutant? 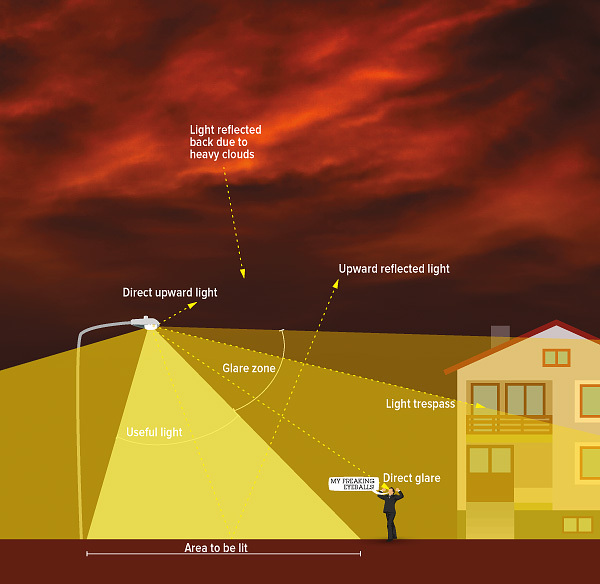 Image above illustrates various components of light pollution and what kind of lighting design is “good”. (Image by Anezka Gocova, in “The Night Issue”, Alternative Journal 39: 5 (2013). Light pollution is a result of increasingly rapid industrial development. Sources of light pollution include the construction of exterior and interior lighting, advertising, commercial property, offices, factories, up to street lights or parks. In fact, a lot of outdoor lighting used at night is inefficient, too bright, not directed properly, is not properly covered and emits excessive light. So it is not only light pollution matter but also it is a waste of energy. What are the negative effects caused by light pollution? Without realizing light pollution affects the behavior and lives of all people, fortunately awareness of the negative effects caused by light pollution is increasing. There are many community groups such as scientists, environmentalists, architects, building owners and governments who strive to minimize light pollution. Using cover or reflector so that it is effective in illuminating the desired area.